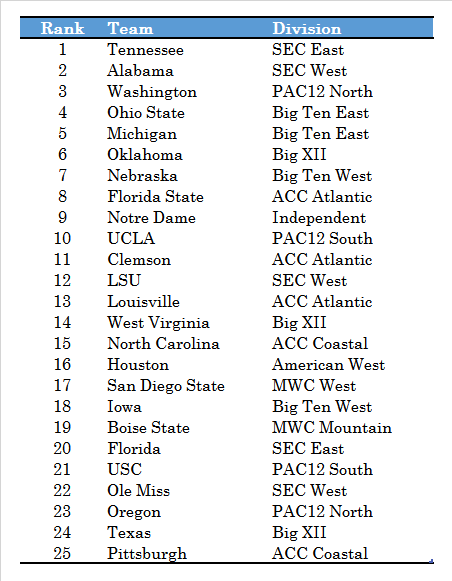 With an average ranking of #2 over the past two years, McIllece Sports ties Phil Steele (#3 in 2015, #1 in 2014) with the most accurate college football predictions in those two seasons combined. The next closest set of predictions over the past two years comes from PickSix Previews, which tied for 3rd in 2014 (USA Today) and tied for 6th in 2015 (ESPN, Sports Illustrated, Wrathell’s CPA Rankings). The McIllece Sports top 25 and divisional predictions are posted below. These predictions can also be found (without preceding text) on the Season Predictions page. In the divisional standings tables, AvgRank is the team’s average finish from 70,000 full season simulations, and Championship % is how often they won they division in those simulations. The predicted order of finish in each division is based on AvgRank. Can there be some explanation of what the numbers in the College Football Notebook are? Such as, what does “power” “offense”, and “defense” mean? Not what the words themselves mean but how the numbers relate to them, how the numbers are derived. Thanks for all your work! Hi Carl, thanks for your question. The College Football Notebook 2016 post has been updated to include an explanation of Power, Offense, and Defense.